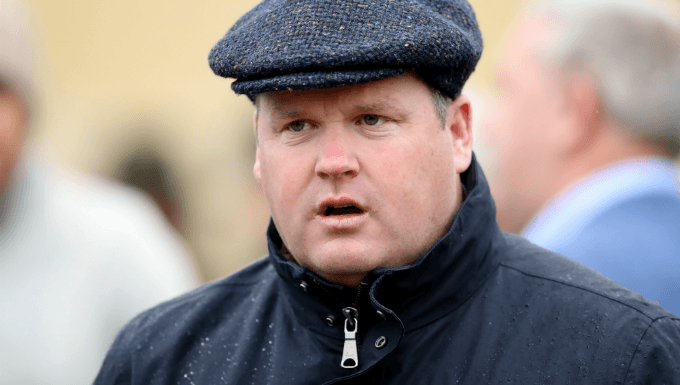 Gordon Elliott's Out Sam is third favourite in Sunday's Troytown Handicap Chase betting as the trainer bids for an unprecendented fifth successive win. Mala Beach took his tally to four in Navan's €100,000 test last year, and Out Sam could lead an army of 10 this weekend, but Elliott's squad does not head the Troytown betting, with the Willie Mullins-trained Pairofbrowneyes and Minella Beau vying for favouritism. Both favourites for this year's Troytown Handicap Chase showed good form last year, Pairofbrowneyes (8/1 Coral) making a winning debut for new trainer Willie Mullins at Gowran Park, prior to falling in the Irish Grand National at Fairyhouse. Minella Beau (10/1 Paddy Power) was running well when coming down in the Cork National last time out, but crucially their trainer has won this race just once (with Beroni in 2009) since the turn of the century - and as such it may prove best to look elsewhere for the winner with Gordon Elliott in pole position to take advantage. Of those at the head of the Troytown Chase betting, Out Sam (10/1 Paddy Power) then looks the best bet. He showed promise in staying chases last season, finishing third in the Ulster National over 3m4f at Downpatrick in March and winning the Munster National at Cork (3m4f, yielding) recently. Those efforts came over half a mile further than the distance of the Troytown Chase, but he has run well over this sort of distance before, including when a good third in a heavy-ground handicap chase over 3m at Fairyhouse last April. Ordinarily there’d have to be doubts about a horse who’s done much of his racing on softer surfaces, with good ground forecast for Sunday’s feature, but the nine-year-old was placed in a couple of valuable good-ground handicap chases during the 2016/17 season, proving he is also a force to be reckoned with on a sound surface. At 10/1 with Paddy Power he looks worth an each-way bet. Runner-up to Out Sam in the Cork Grand National was stablemate Rogue Angel (14/1 Bet365), a regular in these big staying handicap chases, as evidenced by his third in the prestigious Kerry National held at Listowel over this distance in September. Owned by Gigginstown House Stud, Rogue Angel has had a busier time of it than most this season running four times since transferring to Gordon Elliott's from Mouse Morris’ earlier this year. Off the mark at the first attempt for the stable on good ground in a 3m1f handicap chase in July, Rogue Angel has placed on two of his three subsequent outings, and gets to race off the same handicap mark as when finishing runner-up to Out Sam at Cork. The 10-year-old’s schedule has been similar to last season, having taken in both the Munster National at Limerick and Cork Grand National, but last year he was beaten 49L and 30L in those two races, while this time he was beaten 12.5L at Limerick and 1.75L at Cork. He appears to be coming into Troytown Chase 2018 in much better form and it is reasonable to expect a greatly improved performance from Rogue Angel, who has also shown good form on a sound surface.